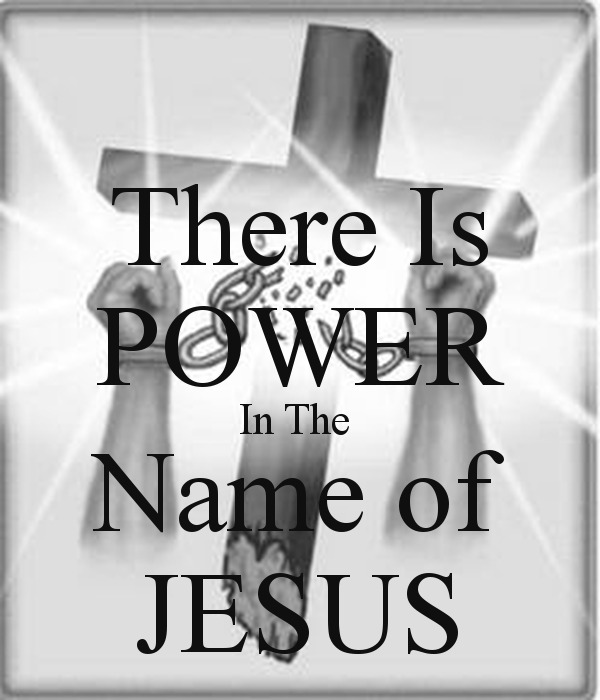 ← “lip service”… All Hail the Power of Jesus Name! How often have we spoken or sung the words superimposed over the cross to our right? How often have we spent more than five minutes considering what that phrase means? It is true, that there is power in the name of Jesus Christ, yet to fail to grasp what that means practically, concerning our walk of faith, places us at risk of giving “lip service” to the truth of God. To do this is unacceptable to God, at best, and irreverent at worst. In either case, failing to grasp that power in Jesus name and properly exercise faith in it, is to damage the testimony of Christ. Our discussion this time, is not and exhaustive study of the name of the only Begotten Son, in the entirety of the bible, but a hearty morsel, enough for the sincere to “taste and see that the LORD is good”, in taking in the power of Jesus name. Let us consider the passage, we will continue to look to from Acts Chapter 3:16, remembering that Peter is explaining how the man who was lame for 38 years, had been made well, in the midst of thousands of onlookers. In Acts 3:16 we see clearly that it is faith in Jesus’ name that made this man well. Despite many Christians having read this passage or at least heard of it and would most likely say “Amen” to this truth, few have really consider the ramifications for us in our time. Jesus had Himself commissioned the disciples to minister in this exact manner in Mark 16:15-18 “Go into all the world and preach the gospel… “He who believes and is baptized will be saved; but He who does not believe will be condemned. and these signs will follow those who believe; In My Name they will cast out demons; they will speak with new tongues; they will take up serpents; and if they drink anything deadly, it will by no means hurt them; they will lay hands on the sick and they will recover“. Once more we see a statement clearly indicating Jesus’ name at the head of the ministry of the Holy Spirit, which confirms the preaching of the gospel (Mark 16:20). In order to understand why this is, let’s look at another passage from John’s gospel. Here we see, that those who receive Jesus by faith, are granted the right to become God’s children. Wow! But what does it mean to receive Him according to this passage. Simply put “received” means to “lay hold of” or to “take”. To receive Him means to take Him as He is, yet this passage gives us a little more to go on. Those who receive Jesus are “those who believe on His name” (vs. 13). In the first place we must consider the Jewish context of this passage. In the Hebrew culture of Jesus’ time, in fact middle eastern culture in general, everything about a person was contained within the confines of their name: a persons character, ability, upward mobility, honor and heritage. It is not to say that they chose names considering the message that child would carry. When reading the O.T. prophet Hosea, this becomes clear. Although names are chosen today for far more frivolous reasons, this cultural under pinning is not lost to everyone. Each one of my children have been named to represent servants of God, as chronicled in His word and my wife and I are disciplined to remind our children who they represent when they are away from us (not the Erdel family primarily, but Jesus Christ the Messiah). Scripture reminds us of the power of a good name. Proverbs 22:1-2 A good name is to be chosen rather than great riches, Loving favor rather than silver and gold. The rich and the poor have this in common, The Lord is the maker of them all. Fully God; the Word who was with God and was God (John 1:1). He is Creator (John 1:3; Colossians 1:15-16). This makes Him the virgin born Son Immanuel, the fulfillment of prophesy (Isaiah 7:14). In His name, as the Atonement, He is also “the LORD who heals…” (Isaiah 53:5; Exodus 15:22). His name, Jesus Christ (Yeshua Hamaschiah) reveals He is God’s “Anointed” or “Messiah” and the only Begotten Son” (John 1:17; Psalm 2:2; Isaiah 11:1-11, 61:1-3). In His name as the Atonement and the Anointed of God, He is the LORD who sanctifies” (Isaiah 53:5 and Isaiah 61:1-3). In His name as the “Anointed” He is the King of Israel, who will return (John 1:49; Psalm 2:6-12). To receive Him, is to believe on His name. 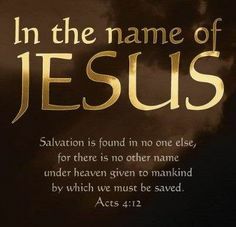 To believe on His name means to trust that Jesus Christ is all of the above and that in His name is the power that each title brings into the life of the one who has faith in His name. He is our Savior, Sanctifier, Healer and soon coming King, but not just in a head knowledge fact sense. ; He does these things in God’s power in the one who truly trusts and obeys. In my next post we will dive into the depths of this wonderful truth concerning the power that is in Jesus’ name!!! You do not want to be left out. This entry was posted in Acts 3:16, All Hail the Power of Jesus Name, John 1:12, Uncategorized. Bookmark the permalink.